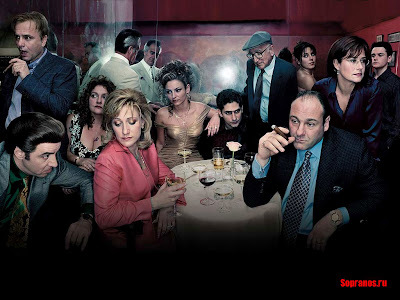 Whispers in the Loggia: Farewell to "the Family"
Last week's bit on the Humanitas-as-weapon cameo in Episode 2 of the final run of The Sopranos really got me thinking... and not just of the Paulists who award the annual prizes. Luckily, the good Fathers have offered their stage to explain my clan's affinity for the legendary-in-its-own-time HBO mob drama, so for those who haven't yet seen it, "Almost Holy" has made a return cameo of its own over at BustedHalo. On a final note, some have been so kind to ask what happened to the column over the last couple months. To quote BH editor-in-chief/rockstar/award-winning panel moderator, Bill McGarvey the short answer is that I've become "allergic to deadlines." Honestly, it isn't so much that I've become, but the symptoms have gotten out of control of late. Unfortunately, they haven't come up with a shot to cure that yet... unless you count shots of espresso. And one can only have so many of those... a lesson I learned the hard way.